Hajj is one of the fundamental pillars of Islam. Every Muslim yearns to perform the Hajj once in a life-time. Many use their life's savings in order to make the journey to the House of Allah. Each year at least two million Muslims gather in Makkah in the largest single gathering of mankind anywhere in the world to perform the Hajj. Allah subhanahu wa ta'ala in His Infinite Wisdom and Mercy has declared the Haram the sacred sanctuary. No profanities or lewdness are permitted within its precincts. Those who seek protection within its boundaries are safe. The hujjaj (pilgrims) who come to the House of Allah are assured complete safety and protection by the Creator Himself. Along with performing the manasik (ritluals) of Hajj, Allah aubhanahu wa ta'ala has also ordained that Muslims must proclaim their dissociation from the mushrikeen during the Hajj. Yet, it was precisely during such a proclamation in Makkah last year that hundreds of hujjaj were gunned down or beaten to death by the Saudi security forces. Several thousand others were injured. The sanctity of the Haram was violated and the security of the hujjaj was trampled upon, in complete violation of the Qur'anic injunctions. Why? This question has continued to agitate the Muslims since the massacre in Makkah on July 31, 1987. The assault on the guests of Allah has also brought into focus the question of the control and administration of the Haramain. Should the Haramain the two holy cities of Makkah and Medina, which are the common heritage of the Ummah remain under the control of a single family? And does that family or collectivity of families and regimes have the right to dictate how the Hajj is to be performed and by whom? While no Muslim has publicly stated so far that religion must be separated from politics, there are many, especially among the ruling elites, who want to reduce Islam to mere rituals. The manner in which mosques throughout the Muslim world, with the exception of Iran, have been reduced to places of ritual worship only, reflects this trend. The emphasis on only the rituals of Hajj is another example of the same trend. This trend is for the status quo which insists that Muslims must accept their role in subservience to the forces of kufr. But this is not universally shared by all Muslims. In fact a more dynamic view holds that the present jahili system must be replaced by the Islamic system as laid down in the Qur'an and exemplified by the sunnah of the Prophet Muhammad, upon whom be peace. This trend also believes in the Hajj as a dynamic activity and an occasion to foster true Islamic brotherhood by proclaiming the dissociation of the believers from the mushrikeen. This book not only provides a detailed account of last year's tragedy in Makkah but also examines the background to the emergence of the House of Saud. It was placed in control of the Haramain by the British in order to prevent the re-emergence of Islam in its dynamic, global role. 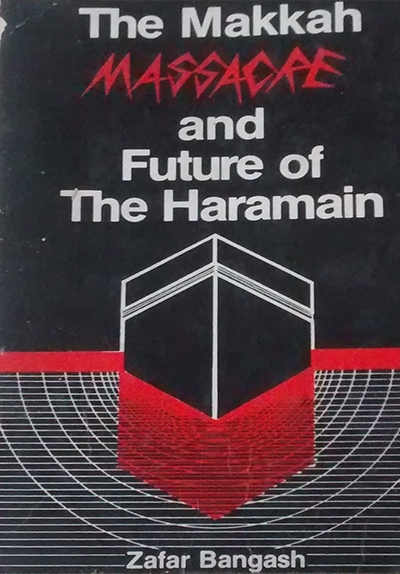 Under the cover of’guardians of the Haramain', the House of Saud has served, first British, and now American, imperial designs to the detriment of Islam and the Muslims. The Makkah massacre has also led to much debate and renewed demands in the Ummah that the Haramain must be taken out of Saudi control. On the outcome of this debate will depend the future of the Ummah. This book is an attempt to add to the understanding of the issues involved in this debate.